When a drunken mob has you pinned to the ground and under ferocious attack, you are under a deadly threat. Many people have been killed with one punch to the head, let alone a pounding, stomping, attack by a mob. HUNTINGTON -- A man and woman were transported to a local hospital Monday afternoon with wounds from a stabbing in downtown Huntington. The incident occurred about 1:30 p.m. at the corner of 5th Avenue and 9th Street. Huntington Police would not disclose information at the scene. The incident happened after an altercation that ended with a man stabbing a woman in the hand and man in the stomach, according Huntington Junior College student Gregory Baker, a witness at the scene. Baker said it appeared that the man was acting in self defense when he pulled out a knife and stabbed the woman in the hand and one man in the stomach. A good statement, though I would advise Congressman DesJarlais to avoid the loaded leftist term "gun violence". This comment is distasteful as it is illogical. It is especially offensive because the efforts by the White House and their allies are more about winning an ideological battle than truly addressing the underlying causes of gun violence in America. Like many of my constituents, I am a proud gun owner and strong supporter our Second Amendment right to keep and bear arms. But I am also a colleague of former Congresswoman Gabby Giffords and I am father, who has a child nearly the same age as many of the victims of the tragedy at Sandy Hook. I pray that we never again see another Newtown or Tucson or Aurora or Virginia Tech. And I firmly believe we must work to prevent these unspeakable acts of violence. But the legislation that was defeated in the Senate would have done nothing more than erode the privacy of law-abiding Americans and create a government registry of all individuals who own firearms and the types of firearms they own. In fact, even one of the sponsors of the bill admitted their proposal would not prevent another mass shooting like Newtown. Yet the administration continues to push for these sorts of superficial solutions while portraying their opponents as beholden to the gun lobby or unconcerned about keeping guns out of the hands of dangerous individuals. This approach is unfortunate because it has left us unable to develop real solutions to decrease gun violence in America. Russia has had far more than its share of tyranny in the past 100 years. The State has never recognized a widespread right ot arms in Russia. 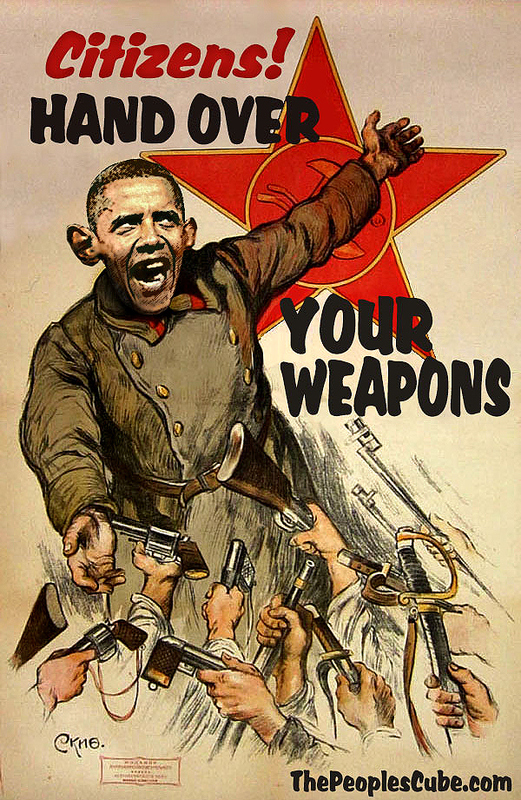 Russian President Vladimir Putin “opposes gun sales for self defense,” UPI reported yesterday. "I do not support the idea of free arms distribution in Russia," the report quotes from comments the federation head of state made to a Russian television station. "It is dangerous to artificially stimulate this process." Putin’s remarks were in response to a shooting in Belogrod on Monday by a convicted criminal who allegedly stole his gamekeeper father’s rifle and opened fire outside a hunting store that had refused to sell him ammunition, killing six people, including two girls. That was done in spite of Russia’s gun laws, categorized as “restrictive” by GunPolicy.org, a project of the Sydney School of Public Health administered by leading proponents of international “gun control.” In fact, Russia already has in place a “wish list” of what such advocates represent as “commonsense gun safety” measures, including a ban on ownership of handguns, an “assault weapons” ban, licensing and registration for “sporting arms” (with required requalification renewals every five years), bans on concealed and open carry (except for limited “sporting purposes” activities), mandatory background/medical/mental health checks, mandatory training, and the like, with severe penalties for gun possession violations. Despite those restrictions, Russia’s homicide rate in 2009, the last year GunPolicy.org presented comparable statistics, was 15.1 per 100,000 people (per The Atlantic, “the highest murder rate in Europe”), compared to 5.48 in the United States, and its total suicide rate was listed at 36.14 for 1998, again the last year presented. By comparison, the U.S. rate was less than a third of that during the comparable period, with approximately half of that rate attributed to gun use. "What is the right to life, ingrained in our constitution, if you don't have the right to bear arms?” the gun group’s founder, Maria Butina asked. “If a person wishes to defend himself, he has no means for protection." Activist, Artyom Ryabov put things in starker terms, identifying the true core motivation of citizen disarmament by “compare[ing] the current situation to that of 1917, when he said those opposed to the Bolshevik Revolution were left without weapons and were therefore powerless to stop ‘tyranny.’"
Disturbing new details have emerged in the attempted killing spree which occurred last August at the Family Research Council, in Washington, D.C. Although one person was wounded, it could have been much worse, according to the would-be killer. Floyd Corkins II entered the Washington headquarters of the Christian lobbying group with nearly 100 rounds of ammunition and 15 Chick-fil-A sandwiches stuffed in his bag. A security guard subdued Corkins, but not before firing three shots, wounding the guard. But in a recently released FBI interrogation / surveillance video of the attack, authorities have learned Corkins intended to smear the sandwiches on his victims’ faces as a political statement. Outraged over Chick-fil-A president’s outspoken opposition to gay marriage, Corkins set out to shoot as many people as possible. He plead guilty to three charges in February: interstate transportation of a firearm, assault with intent to kill while armed and committing an act of terrorism while armed. He faces up to 70 years in prison if convicted. NEW ORLEANS -- Police say a homeowner had to defend himself Sunday after a man entered his home on North Broad Street and began fighting the people inside. The homeowner shot the suspect, who later died at the hospital. NOPD spokesman Officer Garry Flot said the suspect, who hasn't been identified, entered the home and began fighting with the people inside. At some point, the home owner shot the suspect "to protect himself," Flot said. The South Carolina gun turn in brought in 70 firearms for $50 and $100 gift cards, $50 for shotguns and rifles, $100 for handguns. From the pictures in the online articles, it appears that most guns were .22 rifles and single shot shotguns that normally bring from $100 to $200 at gun shows or guns stores. At least one rifle was a Remington 552, which retails for over $500 new. The only picture of a handgun collected appeared to be a very inexpensive, old .22 revolver, less valuable than the $100 gift card offered. 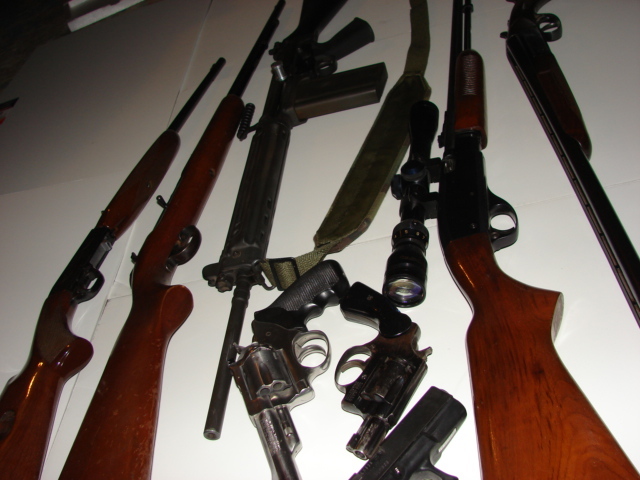 Handguns were reported to be about half of the total number of firearms turned in. Much of the reporting was laced with emotional advocacy for more restrictions on the private ownership of firearms, though academic studies indicate that these turn in events have no measurable effect on crime. "Buyback" is a propaganda term that implies that all property belongs to the government, and that people are only allowed to own it for a while. It is untrue, as none of the guns bought in these events were owned by the government, so they cannot be "bought back". No private buyers were reported at this turn in event, so some nice guns such as the Remington were turned in for $50, and will now be destroyed. Some states are passing legislation to prevent the senseless destruction of these valuable resources. KNOXVILLE, Tenn. (AP) — A state prosecutor will not seek charges against a Dollar General store manager who shot and killed a fleeing robber in the back. Knox County District Attorney General Randy Nichols told The Knoxville News Sentinel (http://bit.ly/18aeFtP ) that he notified the police department of his decision not to press charges in the fatal shooting on Feb. 27. Sylvia Armen doesn't remember much about Saturday's deadly encounter with Andrew Moore, a customer-turned-assailant at Armen's House of Music in Bethel Park. But what she does recall is frightening. "He wanted to look at guitars. He didn't ask for any money," the 72-year-old said Saturday evening, after being treated for injuries and released from UPMC Mercy hospital. And then, seemingly unprovoked, Mr. Moore pounced, clubbing her on the head. Just as suddenly, police said, Mr. Moore was dead, shot and killed by Mrs. Armen's husband, Alfred, 73, after a brief but violent struggle inside their store late Saturday morning. Locked and loaded and in the hands of the ladies. The Somerset County Sheriff's Office is hosted an event for women only and over 100 women attended. "I just don't think anyone should pick up a gun without knowing all of the safety and rules about them," Lugene Dunmyer said, who attended the course. Women were taught how to handle and shoot the firearms and were critiqued on their stance. They even had pictures of real people to act as targets. 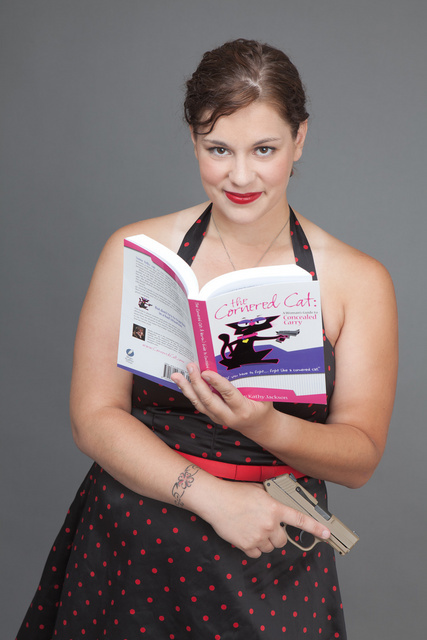 "I felt more secure and I felt I had a better understanding of what a weapon can do. I feel safer and I didn't fumble with it. I felt a sense of security with it ," Kimberly Buterbaugh said, who attended the course. Atlanta GA --(Ammoland.com)- Mark Walters and AAR bring Tucson gun dealer and author of the riveting book, Guns Across the Border to Armed American Radio listeners nationwide, Sunday 4/28/2013. Mike exposes his undercover involvement in Operation Wide Receiver, the precursor to Operation Fast and Furious. Mike will join regular AAR contributor, David Codrea for a riveting full hour to discuss his perilous three-year participation in the ATF “gunrunning” operation. Syndicated nationally and distributed by the Salem Radio Network, Armed American Radio airs every Sunday on over 177 affiliates in hundreds of cities across American including the digital Cable Radio Network. The state Senate has passed a bill that would allow concealed-weapons permit holders to carry guns into bars and restaurants until midnight -- a victory for Second Amendment advocates. The bill's 33-5 vote Tuesday with bipartisan support came before next week's deadline for sending bills to the House for possible passage. The bill is the first to pass either State House chamber aimed at expanding gun rights amid a national debate over whether more or fewer gun laws will protect the country against violence such as the school shooting in Newtown, Conn., last year, and last week's Boston bombings. The Craig, Colorado city council is currently debating a bill that would require every household to own a “modern sporting rifle,” specifically any semi-automatic centerfire rifle that accepts detachable magazines. The proposal was drafted by Craig resident Craig Rummel, and includes exemptions for people who are mentally or physically unable to operate a firearm, people who aren’t legally allowed to own a firearm and people who are opposed to firearms ownership on religious or personal grounds. This is in direct protest against the recent hotly-contested gun control package that was pushed through the Colorado legislature. The new laws establish magazine capacity limits and criminalize private gun sales, among other provisions. These new laws have been criticized as unenforceable with many people questioning how they will affect crime, include a majority of the state’s sheriffs. To-date, 43 of the state’s 62 sheriffs have joined together in a lawsuit against the state and these laws. Elbert County Sheriff Shayne Heap and Douglas County Sheriff David Weaver are leading the sheriffs in their fight to overturn several of the new laws. Colorado faces large economic losses as companies like Magpul, HiViz and the Outdoor Channel leave the state in protest of the state’s new gun laws. Additionally, hunters from around the country will be boycotting the state in protest. None other than attorney, author and analyst David Kopel will be handling the sheriff’s lawsuit. The invaders did not want to die. The defender was lucky that he did not have to take more time to access his firearm. An Evansville man who held two home invasion suspects at gunpoint until police arrived shared his story with 14 News. It happened about 10:30 on Wednesday night in the 1,000 block of Idlewild Drive. 22-year-old Paul Lukac and 24-year-old Justin Henschen are accused of breaking into John and Matt Fugate's home, but those two suspects had no idea what was waiting for them. A threat on his family, turned the soft-spoken Matt Fugate, into an armed protector. Matt was behind his bedroom door when out of nowhere, he says two men kicked in the front door of his Idlewild Drive home. .
Four men with significant criminal histories go to a man's home, presumably to harass or attack him. 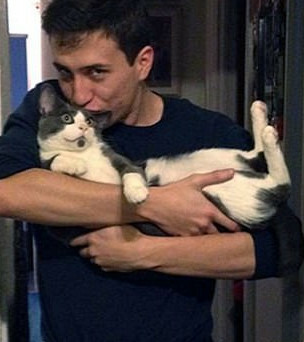 He is in the process of obtaining a restraining order against at least one of them. Multiple assailants constitute a deadly threat. It sounds like he defended himself, then was arrested. Much, of course, will depend on the details. OBERLIN — Four young men were wounded and the man suspected of shooting them is in custody after an argument around 11:30 p.m. Thursday in a parking lot on West College Street, according to police and witnesses. Police Lt. Kevin Scalli described the victims’ wounds as non-life threatening and said the suspected shooter was arrested without incident. Sean M. Woodings, 24, of Oberlin has been charged with four counts of felonious assault, Lt. Mike McCloskey said Friday afternoon. According to the prosecutor, each of the alleged victims has a significant criminal history, including crimes of violence. The Oberlin Municipal Court docket states that Woodings was at his home, and it appeared that the alleged victims were trespassing and that at least one of the victims was told not to be at his home. Woodings was in the process of obtaining a Civil Protection Order against one of the victims before the shooting, according to court documents. Woodings’ written statement said he was prompted to use his gun before he was harmed by one of the alleged victims. California inched closer to passing a gun confiscation bill last week. The bill returns to the Senate for some “non-controversial” amendments and then goes to the desk of Governor Brown. What the people of California need to realize is that this is all a formality. The gun confiscation is already happening and will continue. This legislation would only provide more money to expedite the process. With all of the major news stories this legislation has been largely unnoticed in the media. What I want all of our readers to understand is that what is happening in California, and will continue to happen, is only happening because people do not know and understand their rights. Really? Is this one of the craziest things you have ever heard in your life? This paragraph shocked me. "What happened in Newtown was horrible; everyone can agree on that. But an honest look around the United States shows that it's not states like New Hampshire -- where law-abiding citizens have easy access to firearms - that are home to the worst levels of crime and violence. Instead, the worst crime rates are in those places where even greater restrictions on guns than those being proposed have been the law for decades. " ANYTHING rather than abolish "Gun-free zones"
"A Minnesota school district where two students were killed in a 2003 shooting unveiled a new device Tuesday aimed at adding a last-ditch layer of safety for teachers and students: bulletproof whiteboards. The Rocori School District has acquired nearly 200 of the whiteboards, made of a material touted by its manufacturer as stronger than that in police-issue bulletproof vests. The 18-by-20-inch whiteboards can be used by teachers for instruction and used as a shield in an emergency. Police Chief Phil Jones demonstrated the whiteboards Tuesday in a school gym by leveling a karate kick at one, whacking it with a police baton and stabbing it with a knife -- all with no apparent effect." The third location for the gun turn ins to be conducted during the first three Saturdays in May, 2013, in Phoenix, Arizona has been announced. $100 for rifles, shotguns, and pistols. $200 for "assault weapons". Magazines will be paid for *only* if they accompany a firearm, so there may be opportunities to pick up some scarce magazines for decent prices. They are offering $10 for magazines that have more than a 10 round and less than a 50 round capability, and only $15 and $25 for magazines that are lager than this, those are expensive. I doubt if they will see any. Southminster Presbyterian Church, 1923 E. Broadway Road. Betania Presbyterian Church (Predominantly Spanish speaking), 2811 N. 39th Avenue. The third location will be Sunnyslope Mennonite Church, 9835 North 7th Street. Arizona protects private sales with a strong preemption law. Constitutional carry is state law. It is unlikely that there will be any harassment by police officials, but I would recommend bringing a recorder just in case. No differentiation among rifles, pistols, and shotguns is mentioned, so black powder guns seem acceptable. I do not know if they will accept homemade hand cannons. Bring cash, dress for the weather, and remember to be on your best behaviour. These events attract media, that is what they are designed to do. Private buyers disrupt the careful image of "gun ownership is bad", and "Guns are bad". More details will be coming. A significant media campaign is planned, so details should become very clear as we approach the first Saturday in May. “Operation Wide Receiver,” a precursor to “Operation Fast and Furious” wherein U.S. guns were bought by straw purchasers and “walked” under the noses of ATF investigators into Mexico, has been the subject of numerous Gun Rights Examiner reports. The central figure in those reports was Mike Detty, a gun writer, a firearms dealer, and the confidential informant who literally risked his life over the course of years to do what he believed was right, only to find the obvious criminals weren’t the only ones he couldn’t trust. To begin with, much of what is in section 922 is possessory offenses, occurring entirely within a single state. Supposedly, these provisions are enacted under Congress’s power “to regulate Commerce...among the several States.” I realize that Supreme Court since 1937 has usually been reluctant to rule that a federal criminal statute is outside the interstate commerce power. However, that judicial deference to congressional statutes is premised on the notion that Congress itself has carefully considered the constitutionality of a statute. Chief Justice Marshall’s opinion in McCulloch v. Maryland expressly discussed this point (regarding the Necessary and Proper Clause). President Andrew Jackson’s subsequent veto of the re-charter of the Second Bank of the United States cited the McCulloch opinion to make his point that the political branches must exercise their own constitutional judgment; that a deferential court has not stricken a particular type of law does not excuse Congress and the President from the task of making their own judgments about whether a particular bill is constitutional. It's a clear, sunny day on the shooting range. Only the crack of gunshots breaks the silence. What's unique on this range is that all the gun owners are members of A Girl and A Gun Women's Shooting League—and they're all firing AR-15 semiautomatic rifles. "I think there is a small bit of status for a gal that says she owns an AR-15," said Juliana Crowder, president and co-founder of A Girl and a Gun. "Especially right now, since they're so hard to get a hold of." Typical lying by the left. The article does a good job of showing how they inflate the "rightwing" by 90%, while ignoring much islamic terror. "Just got my conceal carry license. I knew it wouldn't take long after I sent it in. To be a Pharmacy Tech in Missouri one gets finger printed by the highway patrol and prints go to the FBI. Easy to find. And would be the stupidest crime of the year if I ever committed one. Anyway I am pretty excited. No gun but a Concealed Carry License. Thought I would share. There are millions of people like Sally in the United States. They terrify those who want to disarm the population. Citizen disarmament requires that most people remain uneducated about firearms and the right to self defense. I look forward to seeing you carrying a personal defense weapon sometime in the future. Louisiana is one of the few states that do not allow restaurant carry. People would be able to carry concealed weapons into restaurants that serve alcohol under legislation approved by the Louisiana House on Thursday. The House voted 62-24 for the measure, sponsored by state Rep. Henry Burns, R-Haughton, amid protests that gun rights proponents are going too far. Burns said restaurant owners could post “gun free” zone signs if they object. At first, many called for a ban on certain guns and ammunition, now there are calls for tougher background checks. Donna Terrell talks with one mother, Regina Pryor, who knows about guns, specifically , one of the most controversial, the AR-15. "They call them assault rifles, but they are not assault rifles," says Pryor. "If people understood the truth of the gun there would not be quite as much fear." Pryor learned to shoot a few years ago, mainly to protect herself and her family. "This AR-15 is one of the semi automatic rifles that's so controversial. And the "AR" doesn't stand for assault rifle, it's Armalite, the company that use to make this gun." Supporters say they like it because it's great for protection at home. And they say it's an easy gun for a women to handle. "Let's say you have a home invasion, that AR for the woman is going to be a lot easier for her to use than that shotgun." AZ:How much did Tucson's Gun Turn In "buyback" Cost? 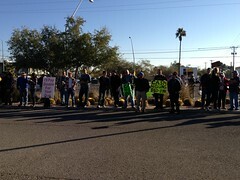 Gun activist Ken Rineer says Tucson's January 8th gun buy back was a waste of taxpayer money. He says the 45 officers who worked at the event and who took the guns to be destroyed, cost the taxpayers nearly $10,000. "We used over 40 officers to take care of a 'turn-in' that realized no benefit," he says. He was able to get a copy of the Tucson Police Department's Special Operation's Plan for the Ward 6 Gun Buy Back. The plan outlines the purpose, mission and areas of operations. It also assigns officers to various tasks and concludes with a wrap up of the event. At the end, it estimates the cost at $9,910. Rineer uses that figure to tally the taxpayer cost. "I would prefer law enforcement do law enforcement," he says. "Not baby sitting a bunch of people standing in line to turn in a firearm." Columbus police detectives are investigating a shooting stemming from an attempted break-in at an apartment on the city's east side early Wednesday morning. According to dispatchers, officers were called to an apartment in the Cornerstone Crossings Apartments complex, in the 5800 block of Chatford Drive at about 12:39 a.m.
Officers tell NBC4 a male suspect was shot while attempting to force entry into an apartment. The suspect fled from the scene and was dropped off at Mount Carmel East Hospital moments later to be treated for multiple gunshot wounds. He was then transported to Mount Carmel West Hospital where he was listed in critical condition but expected to survive his injuries, according to police. The 21-year-old apartment tenant told officers two black males kicked in his front door and fired several shots at the suspects to protect himself. Gunpowder is a propellant, not an explosive. It is safer to handle than gasoline. LAFAYETTE, Ind. (WLFI) - A semi truck carrying 80 pounds of gun powder overturned Thursday morning closing one lane of Interstate 65 near Lafayette. It happened around 3:30 a.m. in the northbound lanes of I-65 near mile 171 (between the Ind. 38 and Ind. 26 exits). Investigators says the driver swerved to avoid a deer, then overcorrected in the interstate median and finally ended up in a ditch. A Midland man died late Tuesday night from a shotgun wound he suffered after attempting to enter a neighbor’s home in the 2400 block of Brunson, according to a press release from the city’s public information officer. Midland police responded to a shooting at about midnight Tuesday and found Samuel Pompa, 32, with a shotgun wound to the chest. He was transported to Midland Memorial Hospital, where he died from his wounds, according to the release. Officers ascertained that Pompa had tried to break into the residence of a 19-year-old man who was living in a separate unit at the same address as Pompa. Colorado Springs police arrested an alleged robber Wednesday with the help of a resident, who they say held the man at gunpoint until officers arrived. The robber walked into a business in the 2800 block of East Platte Avenue about 4:30 p.m., demanded money and indicated he possibly had a gun in his pocket, police said. A man from a nearby business followed the alleged robber after he fled with an undetermined amount of money and held him at gunpoint until officers arrived two minutes later, police said. Now that the man who tried to kill him is off to prison, Greenbrae resident Jay Leone wants his guns and valuables back. But it could take anywhere from a couple of months to several years. Leone's gun collection, bullets, watches and jewelry are being kept in evidence while the convicted attacker, Samuel Cutrufelli, contemplates an appeal. Cutrufelli, who received a life sentence last week, has 60 days to file a notice of appeal, and the appeal itself could take years. Leone, 91, was unpleasantly surprised to learn that his belongings would not be returned to him immediately. "Those guns are worth a fortune," said Leone, 91. "That's stealing from me." The crime occurred Jan. 3, 2012, at Leone's home on Via La Cumbre. Authorities said Cutrufelli, a methamphetamine user with an assault record, broke into Leone's home, put a gun to his head, tied his wrists, blindfolded him, and rummaged through his bedroom for valuables. Leone, a gun collector and World War II veteran, testified that he wriggled his hands free, convinced the burglar to let him use the bathroom, and retrieved one of his five guns from the bathroom. In the ensuing gunfight, Leone was shot once in the face and Cutrufelli was shot several times in the body. The picture says it all. 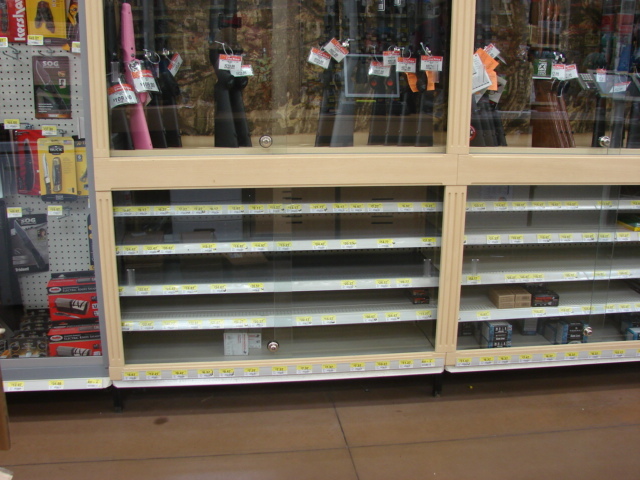 A major metropolitan area, full of liberals, and this is all they could get to protest the NRA. I do not think the NRA is worried. The author Charlie Spiering, says a generous estimate, including media, would be 100 people. I swung by the Stop the NRA March this afternoon to watch the protest and march against gun violence. I was late, but caught two of the speeches before the crowd started marching. People who have guns they do not want anymore will be allowed to drop them off at two locations, A Father's Place on Highway 378 in Conway, and at Friendship Missionary Baptist Church behind the gymnasium. The program will operate from 10:00 AM to 2:00 PM, so you will want to get there early enough to pick out a good spot. Many broken and junk firearms are turned in at these events, but a fair number of people who inherited decent guns, but do not want to have anything to do with them, show up. There are often some pretty good deals. Across the country, freedom fighters are showing up at these events, and offering cash for the better specimens. This should be welcomed by event organizers, if their purpose is to "get guns off the streets". This is because such activity stretches the turn in dollars, prevents poor widows from being defrauded of their valuable property for a pittance, and places guns that are not wanted in responsible hands. Private sales are legal in South Carolina, as they are in most states. Local information would be appreciated, as these events are often held in poor neighborhoods. PA:Gun Buyback Met With Competition In Bensalem. Also in front of the church were people offering to buy the guns off of people before they reached the buyback event. Outside the police station, a group of four or five men gathered to offer cash to people who were bringing guns in. Just outside where the buyback program was being held pro gun activists were offering cash for guns. I beleive this is the same shooting as the previous article from 15 April, 2013. So much for the argument that you can never defend yourself because the criminal will always have the advantage. DAYTON — Dayton Police are planning to charge a 17-year-old with felony attempted aggravated robbery after he allegedly pulled a gun on two men at a home on West Norman Avenue and was subsequently shot in the back. According to a police incident report, a man who was working at the house was taking a break at about 1:45 p.m. Sunday when two young men approached and asked to use his phone and then asked for a cigarette. The man’s boss came around the corner and asked the males what they wanted and then asked them to leave the property, according to the report. The 17-year-old allegedly pulled a gun out of his pants causing the boss to pull his gun and fire two shots. A store owner shot and killed a man attempting to rob his Main Street business Saturday. Hamilton police officers responded to Mazagan Urban Ware, 201 Main St., at 8:34 p.m. on a report of a robbery attempt that ended when the owner shot the suspect, according to a news release from the Hamilton Police Department. When police and fire units arrived at the clothing store, they found the robbery suspect lying outside the store with an apparent gunshot wound, the news release said. The suspect, Jeremy Scott Irvin, 26, of Fairfield, was transported to Fort Hamilton Hospital, where he was pronounced dead. No charges are pending against the store owner, Smail Gueddari, who opened Mazagan Urban Ware in 2011. “Anybody in my place would have done what I do,” Gueddari said on Monday. A botched burglary early Saturday morning at a West Toledo home has left one man dead. BEND, Ore. (AP) — The Deschutes County sheriff's office says a rural homeowner fired a shot Thursday night at an intruder who broke a window. As readers of this blog know, a .22 can be, and often is, deadly. A Muskogee business owner told police he shot a man breaking into his business. Muskogee police are investigating a case where the owner of Fast Wrecker shot a suspected burglar he says he caught breaking into his business early Thursday morning. Oklahoma’s Stand Your Ground law expanded to businesses in 2011, that allows a business owner to shoot an intruder if they feel they fear death or great bodily harm. The intruder doesn’t have to be armed. In the three-and-a-half minute 911 call, business owner, Dale Ford, didn’t know at first if he shot the suspected burglar. This story is from December 27, 2012, but I missed it at the time. HOUSTON (KTRK) -- A woman is alive, thanks to the bravery and quick thinking of two strangers in Liberty County. And incredibly, it's not the only story of heroism to happen this week. ust two days before Christmas, Gary Cherry says he drove around the corner on Route 105 and saw a man stabbing a woman in the middle of the road. "Then we got up and came toward me and that's when I drew my gun. I told him to get on the ground," Cherry said. The licensed gun owner says he held the man until Liberty County deputies arrived. "They were glad I showed up when I did," he said. Crystal Ward came upon the scene and got the wounded woman's son out of the car and to safety. "She was crying. She was telling her mother that she didn't think she was going to make it," Ward said. And on Christmas Day in Cleveland, a neighbor with a concealed handgun license is being thanked for helping police arrest Demetrius Jackson. He is charged with burglary and accused of attacking two elderly women. The gun owner fired shots into the air and chased Jackson until officers could get there. It has been reported elsewhere that the M-4 carbine was one that was in possession of one of the LEOs on the scene, and mistakenly attributed to the two terrorists. When the New York Times reported Sunday about the “four firearms” recovered by authorities investigating the Tsarnaev brothers, suspected of setting off the Boston Marathon bombs, the newspaper described them as an M-4 carbine, two handguns and a BB gun. It would come as a surprise to firearms experts, especially anyone located west of the Mississippi River, that a BB gun is a “firearm.” BB guns do not use gun powder, but air, which is why they are also called "airguns." This does not reduce the severity of the crimes allegedly committed by Tamerlan and Dzhokhar Tsarnaev, ranging from homicide on down, but for the newspaper to call this a “small arsenal” reinforces the notion among gun rights activists that the press will focus on and sensationalize the “gun connection” in covering this crime. See the criminal complaint here. An M-4 carbine is an “assault weapon” under Massachusetts statute, and it is banned. Bethesda, MD - “American gun owners should resolve to drive gun grabbers into social and political oblivion,” gun law expert John M. Snyder said here today. About John Snyder: Named the Gun Dean by Human Events, “the senior rights activist in Washington” by Shotgun News, a “champion of the right to self-defense” by The Washington Times, and “dean of gun lobbyists” by The Washington Post and The New York Times, John M. Snyder has spent 45 years as a proponent of the individual Second Amendment civil right to keep and bear arms as a National Rifle Association editor, public affairs director of the Citizens Committee for the Right to Keep and Bear Arms, treasurer of the Second Amendment Foundation, and founder of www.GunRightsPolicies.org. On 4 April, 2013, Arkansas HB1700 became ACT 746. The revised law will not go into effect until late July or early August of this year. The bill makes a definition change in the statute that has been interpreted to limit the legal carrying of weapons in Arkansas. (a) Arkansas Code § 5-73-120 is amended to read as follows: A person commits the offense of carrying a weapon if he or she possesses a handgun, knife, or club on or about his or her person, in a vehicle occupied by him or her, or otherwise readily available for use with a purpose to attempt to unlawfully employ the handgun, knife, or club as a weapon against a person. The law also clarifies the meaning of "journey". The previous law made an exception for the carry of weapons during a journey. Journey is now clarified to mean travel that crosses a county boundary. Arkansas has many counties of roughly the same size , about 25 to 30 miles on a side. This means that a great deal of travel will fall into the legal category of a journey. In addition the law exempts carry on your own property or property that you have an interest in. There may be legal challanges before the law is accepted by all legal entities in Arkansas. BAR HARBOR, Maine — The owner of the Town Hill Market is cut and bruised but otherwise unharmed after wrestling with and subduing a man who entered the store with a gun Wednesday morning and demanded money. Richard Simis said two shots were fired from the would-be robber’s pistol during the struggle but that no one got shot. A man was shot and killed during what is described as an attempted robbery Thursday evening, April 18. According to the Houston Police Department, the man who died was attempting to rob a man at his home when he was shot. The resident arrived at his home in north Houston about 5:20 p.m. After pulling into his driveway and exiting his car, a gold-colored Lexus SUV, possibly a 470 series, pulled into the driveway as well, blocking the resident’s car. Marcum’s lawyer is quoted as saying that the charges would be dropped. The arrest apparently stemmed not from the T-shirt wearing as such, but from the behavior at the dispute that arose as a result; there is disagreement about who was at fault for that behavior: Video evidence in the case, Mr. White said, indicates that the situation in the cafeteria deteriorated when a teacher raised his voice while confronting Jared. Other students jumped up on benches and began chanting Jared’s name. An Elkins Park man was killed late Friday after he forced his way into a stranger’s apartment in Cheltenham Township. Holding a sign proclaiming “Newtown Dad -- Pro 2nd Amendment -- Why Am I the Bad Guy Now?” Bill Stevens, the Newtown father who earlier this year told Connecticut legislators “You will take my ability to protect my [daughter] Victoria from my cold dead hands,” addressed an approving crowd at Saturday’s Second Amendment Rally at the State Capitol in Hartford. Taking the stage with his daughter Victoria, whose school had been locked down as the Sandy Hook killings were happening, Stevens asked her if she felt safer in lockdown or at home with him and his guns. East Rockhill Township has removed a rule barring firearms from parks and other township-owned property and replaced it with language acknowledging the Pennsylvania Uniform Firearms Act, not the municipality, sets the rules. “It ties the carrying and use of firearms to the state law,” Patrick Armstrong, East Rockhill’s solicitor, said. The change comes after a resident raised the issue, the East Rockhill Township Board of Supervisors said at the April 16 township meeting. Many other towns have made a similar change, board member David Nyman said. “The NRA has asked their members to check with the municipalities to make sure they’re in compliance,” Nyman said. A small Maryland town has unwillingly found itself in the middle of the gun control debate. Since 1975, it's been illegal to carry or fire a loaded gun inside the town limits of Walkersville, Md. Recently, the Second Amendment Foundation, a national gun rights group from Washington state, threatened to sue the town, claiming the town's gun law violates Maryland state law. In a letter, the group demands that Walkersville repeal the law, adding "Failure to do so...puts the town at risk for a lawsuit." President Obama suffered a large, embarrassing loss in the Senate on a slew of gun-control bills. If this were a Republican president, they’d be sounding the lame-duck alarms on the nightly newscasts. But most media outlets can’t do this. They were fully invested in this campaign alongside Obama, and to underscore his weakness is to acknowledge their own. Since mid-December, the broadcast networks and cable news hosts like Piers Morgan and Joe Scarborough have relentlessly lobbied for gun control. On how many occasions did they completely shred the notion of objectivity -- of journalism itself -- and boldly engage in lobbying for gun control, using their networks as megaphones? Let’s consider a few recent moments. 1. On April 11, “Morning Joe” hosted Vice President Biden for a about an hour-long interview -- yes, most people get 5-6-7 minutes, but if you're the Veep and want to promote gun control, you get an hour. It was an embarrasing hour of kissy-face that ended like this: Biden: “Joe, thank you.” Scarborough laughs. Biden: “ No, no, no, no, no. You have changed the debate in America. You.” Scarborough replies, “Thank you so much.” Biden insists, “The two guys that deserve -- if anything gets done -- an award here are you and Michael Bloomberg.” Awwww, shucks. It’s unsurprising that 90 percent have no objections to background checks in a vague polling question. But a new AP poll shows how “passionate” the public is on this issue. They asked: "What do you think the President and Congress should do about gun control? Do you think they should keep working to pass the changes to the nation's gun laws that are currently being negotiated, scrap the current negotiations and start over from scratch, or leave the nation's gun laws as they are now?" It was very split: 39 percent said leave the laws as they are, 38 percent said keep working to pass changes, and 20 percent said start over from scratch. Scarborough can't brag "We are the 38 percent." Montana --(Ammoland.com)-On Sunday, April 21st 2013, “progressives” (euphemism for statist liberals) ran large display ads apparently in all major Montana newspapers claiming that 79% of Montanans want more federal gun control. This humorous number becomes even funnier when it is attributed IN THE AD to “Mayors for Illegal Guns” (Yes, “FOR.” Check your copy). A curious person might ask, why would any mayors be FOR illegal guns in the first place? And, which specific Montana mayors are FOR illegal guns? Another curious person might ask why a group pushing more gun control would cite a “poll” from another group that is FOR illegal guns? Right. None of it makes any sense at all. However, it is stunningly consistent that those advocating gun control never make sense. A poll run by the Helena Independent Record, shows that fully three-quarters of Montanans oppose more federal gun control. That is accurate Montana sentiment. The display ads run throughout Montana provides the names of a bunch of people who claim to live in Montana and be gun owners. Researching these people suggests they are mostly a bunch of liberal operatives, or just dingbats, and are very unlikely to actually be gun owners. None of them have been seen at competitive shooting matches in Montana. It’s a safe bet that hardly any of them regularly purchase hunting licenses. They’re so clueless they selected a photo for the ad of a man carrying a tripod, thinking it’s a rifle. Gun rights advocates understandably celebrated Wednesday after the Senate failed to approve any gun control legislation. It's hard to say what is more gratifying--the defeat of even the "universal background checks" legislation (once thought to be unstoppable, especially with ostensibly "pro-gun" Republican Senator Pat Toomey on board), or the fact that Senator Dianne Feinstein's (D-CA) bill to ban so-called "assault weapons" went down by a bipartisan supermajority. It was indeed a victory worth celebrating, but there is no more time for partying. Now it's time to get back to work fending off the next wave. And there will be a "next wave." Rabidly anti-gun billionaire and New York City Mayor Mike Bloomberg has already telegraphed his intention to pump additional millions into both pressuring perceived "swing votes" in the Senate, and unseating any senators who do not succumb to that pressure. Meanwhile, Senate Majority Leader Harry Reid (D-NV), no longer bothering to try to maintain the "pro-gun" facade he has hidden behind all these years, vows to take another shot at passing S. 649, with the apparent strategy of again amending the bill to soften the details of the background check language just enough to change the minds of five of the senators perceived to be susceptible to the pressure the anti-gun groups, the Obama administration and the mass media have never stopped putting on them since well before last week's vote. Senator Max Baucus (D-MT) is already the target of a new ad campaign, although not a particularly competent one, claiming to quote a poll commissioned by "Mayors For Illegal Guns." For those who believe, like the administration that Second Amendment enthusiasms are expressed solely by the black-helicopter-fearing Right, I offer a decided socialist. George Orwell, who Christopher Hitchens once wrote, was “conservative about many things but not politics,” nevertheless would be more in tune today with the anti-gun control crowd than any fellow socialists. The easy riposte to this claim from the Left would be that it is only natural that a former coolie-crushing colonial policeman such as Orwell would be a gun enthusiast. These sentiments were not based on any theory, but hard worn experience. As a soldier on the Loyalist side during the Spanish Civil War, Orwell was aware that it was only the citizenry breaking into the armory that initially repelled Franco’s fascist rebellion. When Stalin sought to import his murderous purge trials into Spain, and thus kill off any leftist opposition, his first order of business was confiscating their weapons. Having the misfortune of belonging to a Trotskyite militia, Orwell engaged in street fighting with these gun confiscators. Aware of how Stalin crushed his weaponless opposition, Orwell was determined for this never to happen again. In 1940, when a Nazi invasion seemed all but imminent, Orwell joined a citizen’s militia, the Home Guard, which was deliberately modeled on the “people’s army” of Spain (many of the volunteers had fought for the Loyalists). This group was tasked with protecting bridges and railroads and if necessary, fighting from house to house, but Orwell saw a bigger role: that of ensuring that a home-grown fascist coup and/or separate peace would never happen. Predictably, Colonel Blimps worried about any sophisticated weaponry getting to these “reds” and sought to halt it (a better example of gun control cannot be imagined). But Orwell believed that the Home Guard should remain weaponized beyond the war so as to protect individual liberty. Today Orwell would be written off as a gun freak by the Democrat’s war room. Dianne Feinstein would lump him in with the NRA for his belief that citizens armed with assault weapons were necessary also in peacetime to ensure the government remained democratic. His extrapolation that the enslaved popularce of Nineteen Eighty-Four occurred because Big Brother had disarmed them would land him on the Democrat’s list of paranoids. Ron Capshaw has appeared in National Review, The Weekly Standard and the Washington Times. He lives in Midlothian, VA.
Four months ago, gun owners believed their world was about to close in around them, but today, polling by both Rasmussen and USA Today suggests that support for stronger gun control laws has waned considerably. Last week’s vote on background checks and other anti-gun legislation that proved to be an embarrassment for President Barack Obama was not the final nail in the gun prohibition lobby’s coffin, but it did demonstrate that reason is returning where emotion had been busy. This is not likely to blunt plans for the recently-formed Washington Alliance for Gun Responsibility (WAGR) to run an anti-gun initiative in 2014. This column participated in a discussion last week which will air sometime later on guns and gun rights. One of the other participants was Tina Podlodowski, one of the WAGR leaders. The new polling results were not available then, having only been released Monday morning, but it probably will not discourage the gun control crowd. Both polls said that less than half of those surveyed – 49 percent in both surveys, coincidentally – now support tougher gun laws. Still, the USA Today poll found only 45 percent opposition to tougher federal gun laws, so the antis still hold a statistical edge. But as the newspaper noted, in early April, NBC and the Wall Street Journal sponsored a survey that revealed 55 percent of the people favored a stricter gun law, but that was down from 61 percent in February. Now retired, "Shotgun Shirley" represents the biggest increase among Florida's more than 1 million people who have concealed-weapon permits: women 66 and older. The number of women in the youngest age bracket, 21 to 35, jumped 463 percent to 40,386 -- four times more than men in the same age group. After the death of her husband three years ago, Hedge began worrying about her safety. "I didn't realize how vulnerable I was until I started thinking about it. … I was in denial," said Hedge, who five months ago bought her first guns — a .22-caliber target pistol and .380-caliber semi-automatic for self-defense — and received her permit two weeks ago. Sometimes it's important to pay attention to what the people on MSNBC say, because it can actually give us insight on just what we should do for liberty. That's the case with "Pointless Nullification in Kansas," a blog post by Rachel Maddow Show producer Steve Benen. Surprising as it may sound, conservatives interested in preserving the Second Amendment can look to Benen for all the advice they need. In conjunction with the above clause, the bill defines what is meant by "the Second Amendment to the Constitution of the United States" and contends that it isn't based off a decision by the Supreme Court. By definition, state and local agents cannot enforce any acts or actions that are "null, void and unenforceable in the state of Kansas." Based off this text, the state of Kansas now cannot participate in any federal gun control measures that restrict the individual right to keep and bear arms as understood when Kansas became a state in 1861. "Apparently Barack Obama threw a bit of a hissy fit when the gun control legislation went down in the Senate. And, as James Taranto points out, Gabby Giffords managed, in a 900 word screed, to employ about every logical fallacy one can employ in here denunciation of the failure of the legislation to pass. Finally, the NY Time’s Jennifer Steinhauer weighs in claiming that the vote went against the will of the people and that it was the gun lobby’s fault. Gun lobby? Oh, we all know about the NRA. However here’s something I don’t think the left fully comprehends. The real 'gun lobby' is the majority of the American people." TEMPE, AZ - Police say a resident fired shots at two suspects who broke into a Tempe home on Thursday. Tempe police spokesman Mike Pooley said a woman heard a knock at the door of her home near McClintock Drive and Guadalupe Road and thought it sounded odd. Pooley said she went to the garage for a gun and by the time she got back two people were in her home. She shot at both of them, but it's unclear if either one was struck, Pooley said. Pooley said two suspects are in custody and two more got away. The suspects are described as black males and Pooley said police are looking for a black Chrysler 300 with Alberta license plates. Oath Keepers and rally permit holder Gun Rights Across America-Massachusetts were unsuccessful in a motion filed yesterday to overturn the permit revocation for their planned event today on Lexington Green, but went ahead and conducted a brief oath ceremony anyway, the group’s founder Stewart Rhodes informed Gun Rights Examiner this afternoon. “Due to the emergency nature of the moratorium in light of recent events, significantly the Boston bombing on April 15, 2013, the Plaintiff has failed to convince the court of its likelihood of success on the merits and any potential irreparable harm it may suffer therefore the motion is denied,” a handwritten margin notation explains on the Motion for Temporary Restraining Order and Emergency Interlocutory Injunction in the Middlesex Superior Court Department of the Trial Court in Woburn. HEATH, Ohio - Police say a man in Heath fired a weapon at a would-be burglar on Thursday morning. The break-in occurred after 4 a.m. Thursday on the 900 block of Northbrook Court. The resident said he was awoken by his dog and spotted a person with a flashlight in his home. The homeowner said the suspect tried to leave. The homeowner shot once at the suspect, but the bullet hit a door jamb. GRAND JUNCTION, Colo. (KKCO) -- A man accused of stealing a Jeep last week may have taken much more than that. Anthony Loveridge, 19, was arrested after theft victim Joseph Bateman found Loveridge sleeping in his stolen Jeep Grand Cherokee on Friday. When Bateman stumbled upon his vehicle, he held Loveridge at gun point until police arrived. Bateman first reported a break-in on April 3 when he returned home from North Dakota, according to a Mesa County Sheriff's Office arrest affidavit. Dozens of items were stolen, including TVs, gaming systems, phones, five guns, thousands of ammunition rounds and his 1998 Jeep Grand Cherokee. Even Bateman's safe--which contained an external hard drive and the title to his Jeep-- had been broken into, he said. CHARLOTTE, N.C. — Police said they are investigating after a home intruder was shot and killed while trying to force his way into a Charlotte apartment. WBTV reported that the shooting happened around 3 a.m. Sunday at the Alta Grove apartments on Season Grove Lane in northwest Charlotte. Charlotte-Mecklenburg homicide investigators said the intruder was shot after struggling over a weapon with the man who lived there. The store's owner, who was closing up, heard the commotion, looked around the corner, and saw what was happening. As McClure allegedly turned to approach him, the worker grabbed his gun. A struggle ensued, and the worker was shot in the arms, authorities said. The store's owner then armed himself with a semi-automatic handgun and fired at the suspect, who dropped his shotgun and ran out the backdoor of the shop, authorities said. Investigators responding to the scene found the shop worker, who was brought to West Jefferson Medical Center, treated and later released. Soon after, the sheriff's office received a report about a shooting near the intersection of Ehret Road and Champagne Street, which is behind the shop. There, deputies found McClure, who had been shot several times. He was brought to LSU Interim Public Hospital, where he was being treated for possible life-threatening injuries, the sheriff's office said. Paradise Police say that two pit bulls were shot and killed Sunday morning after the two dogs allegedly tried attacking a cat and the homeowners. Police say that the dogs were killed in the 5100 block of Edgewood Lane at around 11:32 a,m. Police say their investigation revealed the two dogs were running loose in the neighborhood and came onto the resident's property, attempting to attack the homeowner's cat. The two dogs reportedly became aggressive and attempted to attack the homeowners who were forced to shoot and kill both dogs. Police say that, "The area and manner in which the dogs were shot was determined to be remote with a safe backdrop, away from neighborhood homes." Foster pulled into the driveway and got out of his vehicle, the release said. The suspects allegedly rammed his vehicle with the Taurus and then turned their vehicle, driving toward him. Fearing for his life, Foster drew a firearm and fired several shots at the vehicle, the release said. NRA President David Keene on WMAL 4-18-13 – Response to Obama calling him a liar. Yes, it is overdone. But it is still funny! North Korea has emphatically denied that they are responsible for the Marathon City of Boston Bombing. They have offered help using their advanced intelligence services. Unsubstantiated accusations of The Peoples Glorious Republic of North Korea's involvement in the pusillanimous bombing attack on the Marathon City of Boston in the Capitalist Dictatorship of the USA are completely false. Any person can easily see that this is misdirection for another purpose. A PGRNK attack would be much more effective. We would kill many thousands, not just three and wound hundreds. This is the mark of total amateurs. In addition to the above facts, the PGRNK did not threaten the Marathon City of Boston. The Marathon City of Boston is not Austin City of Texas. Look on a map. The Marathon City of Boston is hundreds, if not thousands of kilometers removed from Austin City of Texas. Now for the PGRNK help from our glorious intelligence service. We know who did the extremely amateur attack on the Marathon City of Boston. We have analysed the available data, carefully sifted from websites. The type of attack and its extreme amateur type show that only one group was responsible. To help confused Capitalist USA president. We demand more aid for our extremely valuable intelligence report. Send videos and ultra super high speed web links. We must feed our people. If they starve, it is your fault, Capitalist USA. In breaking news the Czech Republic has also claimed that they did not attack the Marathon City of Boston. The Czech Republic did not offer free intelligence analysis. "Of what use is a gun unfed?" Mahbub Ali, in Kim, by Rudyard Kipling. 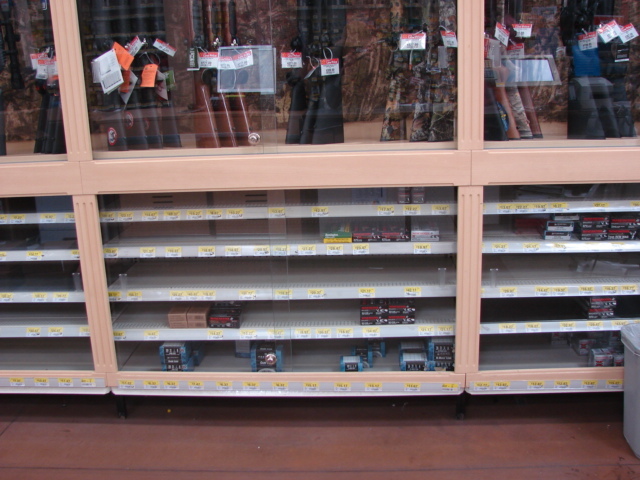 I stopped at the Foothills WalMart in Yuma today, to see what was happening with their ammuniton supply. As you can see, there wasn't much. some 20,16, and 12 gauge bird shot, mostly 7 1/2. I was surprised to see that they had a few boxes of 12 gauge 00 buckshot, at $4.67 for five cartridges. They also had a couple of boxes each of 7mm Remington Magnum, Winchester 270, and 300 Winchester Magnum. The only rimfire that I saw was some .17 magnum. Raymundo, at the counter, was helpful. He said that they do get ammunition in, but it is unpredictable, and when it comes in, it goes out very quickly. He admitted to holding back a couple of boxes for customers that buy guns. He did not want a customer to leave the store with a gun, and not be able to get some ammunition for it. Thing is, I don’t begrudge the city of Boston a single round. The LEOs, God bless ‘em, aren’t taking any chances. But then why should you? Why should you be held to 7 rounds? Or 10. Or any arbitrary number. Who needs 30-round mags? “…legions of heavily armed police” felt like they needed them … for two guys. Then one — one guy. If precaution advises that many trained officers with all that firepower to prepare to take out two baddies — because who knows how heavily armed they are or what they might do — how can we expect a lone homeowner to defend herself against similar unknown threats with seven rounds? Mayor Bloomberg, Governor O’Malley, et al., please, your thoughts? TTAGers, here’s hoping you never need even one and always have access to a whole lot more. The idea that a majority of police support citizen disarmament has always been a lie. When I heard the news that the Senate had failed to pass a Universal Background Check, I was at a police seminar on the topic of active shooters. The panelists had agreed that “active shooter” was a poor descriptor, one noting that some attackers use other weapons, such as the blade-wielder in the recent Texas case. (And, of course, the Boston Marathon bombing was fresh in everyone’s mind.) Another panelist, a retired SWAT lieutenant who has responded to such things for real, pointed out that an active SHOOTER is what it takes to stop an active MURDERER.